My husband and I created this costume completely by hand. We got the idea after seeing beautiful DIY videos for cloud lamps that you could hang in your room. We thought, how awesome would that be on a costume? And so, Stormy the Dragon was born! For the scales and armor, we used 0.5mm craft foam, and carefully cut and shaped each scale 1 by 1, gluing them 1 by 1 as we went along. It was reaaallly tedious. The armor was primed and painted to look armor-like. For the dress, we put hooks all around the waist and tied tulle to each and every hook, to make a voluminous dress. 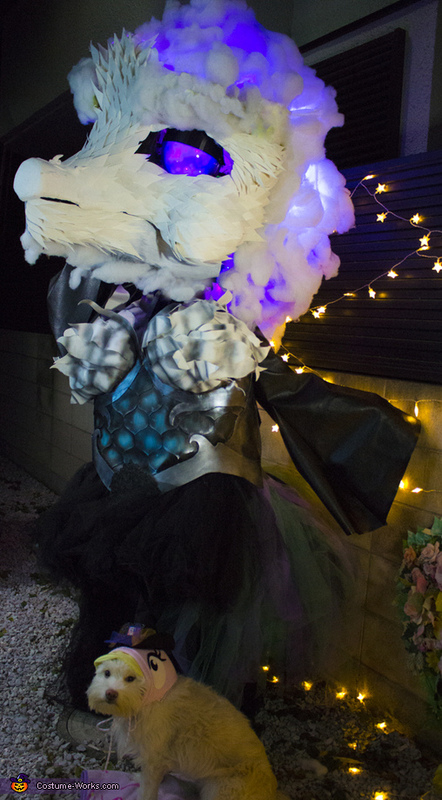 As for the head, we used tons and tons of cotton and LED lights. Talk about sneeze fest! The cotton`s shape is held together by recycled water and soda bottles. You can check out the youtube video above to see her in action. Hope you guys like it as much as we enjoyed making it!